Southwest turned a profit in 1973 and hasn't suffered a money-losing year since — a streak unmatched in the U.S. airline business. Kelleher became Southwest's chairman in 1978 and CEO in 1982, as federal regulation of airline prices was disappearing. He led the company through its period of greatest growth. As Southwest entered new cities, it forced other airlines to match its lower prices. Federal officials dubbed this "the Southwest Effect." Kelleher was so outgoing that it would take him ages to walk through an airport — he seemed to stop every few feet to chat with employees and passengers. He had a booming laugh, a bottomless trove of anecdotes, and a lawyer's precise way with words. In 1999, at age 68, Kelleher was diagnosed with prostate cancer. He kept working, commuting between Southwest's Dallas headquarters and a hospital in Houston, but the incident added urgency for a succession plan. In a statement Thursday, Southwest said, "Herb was a pioneer, a maverick, and an innovator. His vision revolutionized commercial aviation and democratized the skies." 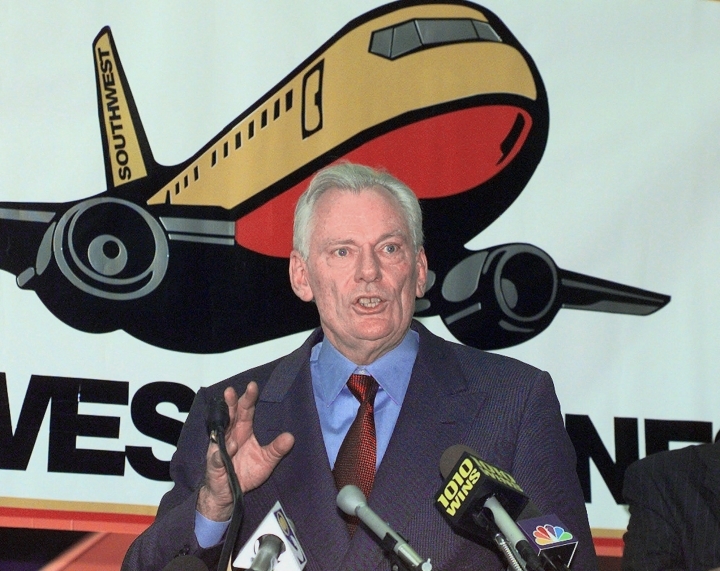 T. Boone Pickens, the oilman and fellow legendary Texas business figure, tweeted, "Herb Kelleher is arguably the most transformative figure and character in the history of modern aviation. He is the epitome of the can-do entrepreneurial spirit."